A Russian Progress resupply vehicle has launched en-route to the International Space Station (ISS) on Wednesday, bringing with it fresh supplies for the Expedition 25 crew ahead of STS-133/ULF-5 next week. Meanwhile, space station managers have been presenting the status of the ISS’ regenerative ECLSS (Environmental Control & Life Support Systems) at the Agency Flight Readiness Review (FRR) for STS-133. Progress M-08M, also known by its US designation of 40P, launched atop a Soyuz-U rocket from the Baikonur Cosmodrome in Kazakhstan at 3:11:50 PM GMT today. Following a three day autonomous free fight, the Progress will rendezvous with the ISS on Saturday 30th October. Docking to the nadir port of Docking Compartment-1 (DC-1) “Pirs” via the automatic KURS system should occur at 4:39 PM GMT. The manual TORU system will be available, should the crew need to intervene in the automated approach at any point. Progress M-08M will deliver 2.5 tonnes of cargo to the ISS, including 1,918 pounds of propellant, 1,100 pounds of oxygen, 498 pounds of water, and 2,804 pounds of food, spare parts and supplies. M-08M will also deliver hardware for the Molniya-Gamma and Coulomb Crystal experiments, and high-speed data transmission equipment which will be installed outside the station during Russian EVA-27 in January 2011. In order the free up the DC-1 nadir port for M-08M, Progress M-05M/37P undocked from the ISS this past Monday (25th October). M-05M will remain on-orbit for another three weeks to enable Russian flight controllers to conduct experiments using the vehicle, and then it will be de-orbited for a destructive re-entry on 15th November. M-05M is filled with many trash items, that have been disposed of by the ISS crew. On Tuesday 26th October, the ISS performed a Debris Avoidance maneuver (DAM) in order to evade a piece of debris from the defunct Upper Atmosphere Research Satellite (UARS). Predictions showed that the object’s radial miss distance of the ISS would have been less than one kilometre. As such, at 10:25 AM GMT Tuesday morning, the engines of the Progress M-07M/39P spacecraft, which is docked to the Service Module (SM) aft port, were fired for three minutes in a posigrade direction. This resulted in an increase in velocity of the ISS by 0.4 meters per second. As such, the Progress M-08M launch was brought forward by three seconds from 3:11:53 to 3:11:50 PM GMT. UPDATE: Progress docked with the ISS at 16:36GMT on Saturday. ISS Managers this week verified that all regenerative Environmental Control & Life Support Systems (ELCSSs) are GO for STS-133/ULF-5 operations. According to the Agency FRR ISS Notes – available in full on L2 – the Urine Processor Assembly (UPA) is working at a limited recovery rate of 70 percent (which equates to at least two hours twice a week), due to a limited supply of Recycle Filter Tank Assemblies (RFTAs). 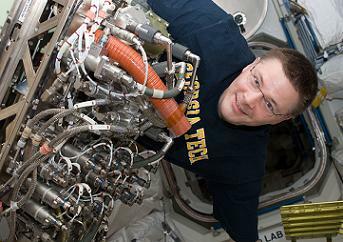 A spare Distillation Assembly will fly on STS-133 to provide a spare for the system, should it be needed. The Oxygen Generation System (OGS) is also working on limited operations due to low pH values in the recirculation loop. The low pH values are thought to be caused by a production of hydroflouric acid as a by-product of electrolysis. “At low pH levels, the zirconium in the cell stack corrodes and forms zirconium hydroxide that clogged the filters and likely caused the hydrogen ORU to fail. A Resin bed remediation kit to remove acid and particulate from the recirculation loop and a spare pump ORU are flying on ULF-5,” the notes stated. 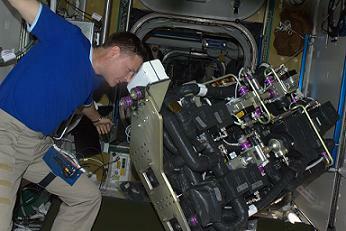 Both of the station’s Carbon Dioxide Removal Assemblies (CDRAs) are operational, with a 3rd “bed” flying on STS-133. The Major Constituent Analyser (MCA) in Node 3 is operational, however the one in the US Lab is not due problems associated with a loss of communications. Both the station’s Trace Contaminant Control Subassemblies (TCCSs) are fully operational. The Water Processor Assembly (WPA) is operational. However, elevated Total Organic Carbon (TOC) levels have been noted. “Elevated TOC levels in the WPA product water has been attributed to dimethylsilanediol (DMSD), which is a breakdown product of siloxanes (anything that contains silicon). This compound has low to moderate toxicity and can be a health concern at high levels,” added the FRR notes. According to recent Station Operations Readiness Review (SORR) notes (L2), Sabatier, which is the station’s latest regenerate ECLSS to be installed, has been fully integrated with the ISS’ current ECLSS hardware. Balancing the thermal coolant loop flow rate across the Sabatier and Oxygen Generation Assembly (OGA) heat exchangers, which ensures adequate cooling performance, has also been completed. The Agency FRR concluded that all regenerative ELCSS systems are capable of supporting STS-133 and any subsequent Contingency Shuttle Crew Support (CSCS) requirements.